Occupy Wall Street's December 17th march to re-occupy vacant space owned by Trinity Wall Street church. Photo by Dustin Slaughter. Editor’s note: This beautiful piece by William Rivers Pitt sums up where, I feel, the Occupy movement stands currently, and captures it with pure poetry. Enjoy. Dewey Square, the patch of earth in the shadow of the Federal Reserve Building and One Financial Center that Occupy Boston protesters called home from September to December, is empty now. The same can be said for the original Occupy space at UC Davis, where a dozen kneeling and defenseless protesters were hosed down with pepper spray, and for Oakland, where the police rioted and very nearly killed a two-tour Marine Corps veteran of Iraq. Occupy encampments sprang up in hundreds of cities in all fifty states of the union over these last four months. Many, if not most, are gone now, done in by police invasion or uncooperative weather, or both. You may have noticed the sudden lack of attention paid to the Occupy movement, now that the gendarmes of the status quo have wielded their truncheons and rolled up the encampments like so many windowshades. Nightly reports by the “mainstream” news media about Occupy actions all across the country have dwindled to almost nil, and for those so disposed, this is a good thing. The roused rabble have been crushed and scattered, and all this talk of inequality and justice can finally be replaced with what has for so long now been the real American anthem: everything is fine, nothing to see here, your betters are in control, go back to work. The uprising has been quelled, it would seem, and it is time to consign the Occupy movement to the dustbin of history. Nothing, but nothing, but nothing, could be further from the truth. This is not over. Not by a long, long chalk. It is not over because the American conversation has been irrevocably altered in ways both subtle and sublime. For those predisposed to rocking the boat, the Occupy movement has provided an opportunity to give voice to the overarching sense that matters in America have gone horribly wrong: uncounted thousands dead in a war of choice that provided a wonderful opportunity for the transfer of hundreds of billions of taxpayer dollars into the bloated coffers of “defense” contractors with friends in high places; billions more stolen in broad daylight by Wall Street gangsters; billions more given back by way of “bailouts” – read: socialism – to these same gangsters thanks to the aforementioned high-placed friends; no jobs, and no jobs, and no jobs, because it is more important to score political points than it is to ease the suffering of millions. For those not immediately predisposed to boat-rocking – the fathers who lay awake at night worrying about mortgage payments, the mothers with sick children who live in terror of the mailman bringing more medical bills, the retail workers making a shamefully substandard minimum wage who are holding on by their fingernails – such highblown talk has always been drowned out by the necessities and requirements of the immediate present. Who has time to camp out in Zuccotti Park when there are bills to pay, mouths to feed and time-cards to punch? And yet those same hard-working over-burdened Americans who have been thus far unable to take up the Occupy banner – who, in many instances, dismiss the whole thing with a contemptuous “Get a job, hippie” – are the same Americans who have had a bug put in their ear, and the buzzing of that bug will not go away. Four months of national dialogue about fair taxation, burden-sharing and the overwhelming power of the corporate state have done their work, and done it well. The conversation in America about wealth and power has been redirected: instead of blindly worshipping the power and prestige of these Sheriffs of Nottingham, who drink the sweat and blood of the toilers for their sustenance and entertainment, a great many people have been made to remember Robin Hood, and what the genuine definition of fairness, equality and patriotism really is. Get it? The second donkey had been carrying his burden for so long that he no longer even realizes it is there, though his back breaks from the strain. For generations now, that has been the sorry lot of the 99%, but it will not be so in 2012; after carrying the load for so long that they didn’t even see it anymore – a fact that suits the 1% right down to the ground, mind you – a vast majority of Americans have finally looked up from their fruitless toiling, seen the unfair and over-burdensome load they carry, and recognized the fundamental injustice that has left them as beaten and swaybacked as that donkey on the road. Occupy is not over. We come now to another winter of our discontent, and though the tents and signs and shouts of the movement have been momentarily subdued, they will return. Spring is coming, the rocks are already rolling down the mountainside, and while there is still time for the pebbles to catch up, gravity is an absolute. Sooner or later, those rocks will reach the reckoning that has been so long in coming, and when that happens, nothing in this country will be the same again. With Spring comes the rain, and the rain is coming to this dry and thirsty land. By God and sonny Jesus, the rain is coming. This op-ed was originally written by the inimitable William Rivers Pitt for Truthout. The Project is republishing this under Creative Commons Attribution-Noncommercial 3.0 United States License. This entry was posted on Friday, December 30th, 2011 at 10:04 pm	and posted in Uncategorized. You can follow any responses to this entry through the RSS 2.0 feed. Beautiful and soaring rhetoric. Unfortunately, if this movement returns after a period of winter hibernation, it will likely not come back as vital as it was in the previous year. While the protesters have gained experience, so to have the police and military. In a way, I hope to be proven wrong regarding OWS. The reality is that the owners have things sewn up. The bastards, pigs, gluttons and cockroaches did not accumulate vast expanses of land, property, wealth and power by leaving loose ends. 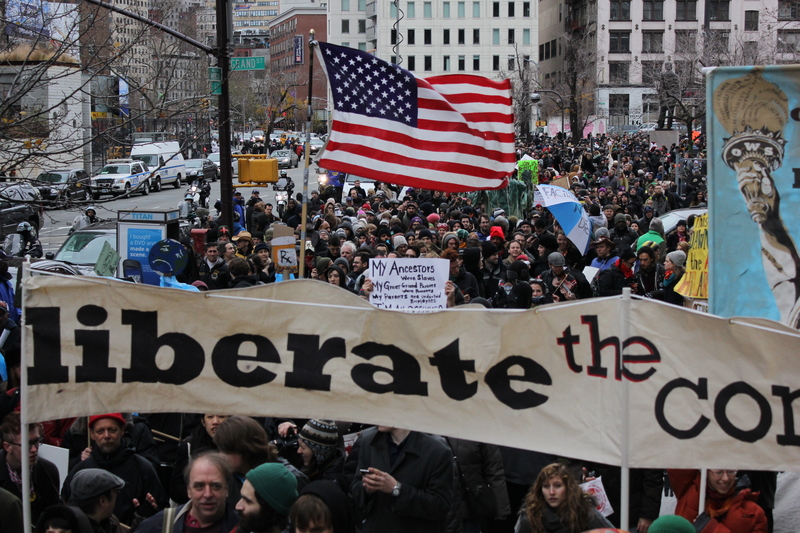 Thank you for this beautifully written comment about Occupy. The creative transitions that Occupy takes will certainly be many and, in my belief, will be what gives this country a chance of really surviving and remembering the best in ourselves.